"Bob Probert and Joey Kocur, along with Bob Duff of the Windsor Star, have a book coming soon. The Bruise Brothers - Hockey's Heavyweight Champions will be released June 1. I bet it ends up being book of the year :)"
The Meaning of Puck: How Hockey Explains Modern Canada - Hockey is more than a game or even a way of life in Canada. Its a perfect window into the issues that confront the nation as it nears its 150th birthday with all its achievements and its challenges. Canada is a land of contradiction and curiosity that is best summed up in the national sport. In The Meaning of Puck, bestselling author Bruce Dowbiggin takes a tour of the country using hockey as his itinerary. In a series of essays, he shows how the national passion of hockey reflects the issues of globalization, regionalism, anti-Americanism and militarism in the new century. Using the dominant themes of the sport, The Meaning of Puck shows the challenges before the nation. More than just a sports book, The Meaning of Puck is a look into the fabric of a nation straining to keep old traditions alive and incorporate new national myths. Hockey Night in Canada: My Greatest Day - Nothing from the publisher yet, but expect another beautifully designed book, just like HNIC's 2007 release By The Numbers. I suspect Scott Morrison collects the stories of NHL greats of the past and present about their memories of Hockey Night In Canada, including their first and/or favorite games played on Saturday night. The Little Book of Hockey Sweaters Vol 2. 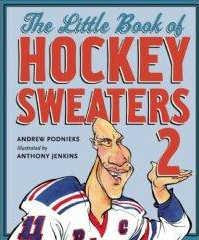 Andrew Podnieks and artist Anthony Jenkins return with a sequel to the popular little book The Little Book of Hockey Sweaters. More stories about why players wear the jersey numbers they do are always entertaining. And I can't wait to see more work from the talent illustrator Jenkins. Say what you want about Don Cherry, but the man knows how to sell. In his first literary release since his autobiography over 20 years ago, the man they call Grapes is teaming up with fellow Hockey Night in Canada cohort Al Strachan to release Don Cherry's Hockey Stories And Stuff. Hopefully they spent a lot more time on the content of the book than they did on the title. Honoured Canadiens: Hockey Hall of Fame - prolific author Podnieks returns with another title, this time looking at the careers of all of Montreal Canadiens whose careers were so great that they were enshrined in Hockey's Hall of Fame. That's a lot of players to cover, from Howie Morenz to Rocket Richard to Guy Lafleur to Patrick Roy. Expect a beautifully designed book from HB Fenn. The Road to Hockeytown: Jimmy Devellano's Forty Years in the NHL The architect of the Detroit Red Wings has been around the NHL for forty years. It shows, because his fashion sense hasn't changed since. But his hockey sense is among the most savvy in history. Now Jimmy D will take a look back at his lengthy career in his autobiography. Herb Brooks: The Inside Story of a Hockey MasterMind - Author John Gilbert gives us another look into the life and times of American's most famous hockey coach, Herb Brooks. The Ultimate Book of Hockey Lists - The Hockey News returns with a new book, following the same tried and true formula that magazines often use for books. This book is obviously a collection of the top, the best, the worst, the funniest and strangest players, events, games and moments in hockey's history. No doubt this will be a popular Christmas buy for fans of all ages and levels. Author Jon C. Stott looks at the mostly unknown story of the old PCHL/WHL minor pro league from 1948 through 1974 in Ice Warriors. For much of this league's existence the NHL was only a six team league, and the top players of the minor leagues weren't much different than the NHL stars. There was some great hockey and great hockey players in that old league, and finally we have author trying to bring those memories back to life. With the 2010 Winter Olympics in Canada, so too comes the Paralympic games. Author Lorna Schultz Nicholson comes out with Fighting for Gold: The Story of Canada's Sledge Hockey Paralympic Gold. Sledge hockey is a very different and surprisingly physical game that has gotten more notice in recent years. Hopefully the 2010 games and Nicholson's book can raise the game to another level again.